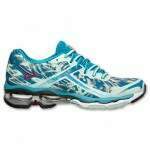 Test your fitness limits with the Mizuno Wave Creation 15 running shoe. Featuring new Infinity Wave technology, this neutral running shoe provides a brilliant blend of cushioning and support to help you set a new personal best. Mizuno Wave Technology® reduces impact force by spreading energy throughout the whole foot, promising a smoother run. Dynamotion Fit? increases comfort by reducing foot rubbing on the upper and an updated heel counter offers a more comfortable and secure fit. Lightweight U4ic midsole promotes efficient energy return and long-lasting durability. SmoothRide? design reduces rapid foot acceleration and deceleration during transitions, promising a smoother and more cushioned ride. Carbon rubber outsole delivers aggressive and versatile grip.